A hot tub is one of those luxury items that really make you feel like you’re living in a mansion up in Beverly Hills with all the money in the world – even if that hot tub is parked out behind your mobile home. 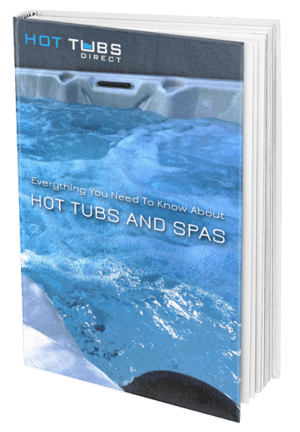 Unfortunately, many hot tubs are quite expensive and for some, particularly after retail markup, you might even pay more for it than the cost of the aforementioned mobile home. But that’s not the case with all of them, as I found out, and if you want an affordable hot tub that doesn’t require a dedicated, this might just be what the doctor ordered. Permanent hot tubs can be expensive. They start at about $1000 and go on up to close to $10,000 with $3500 being the average price. For many people, this is simply out of the question. 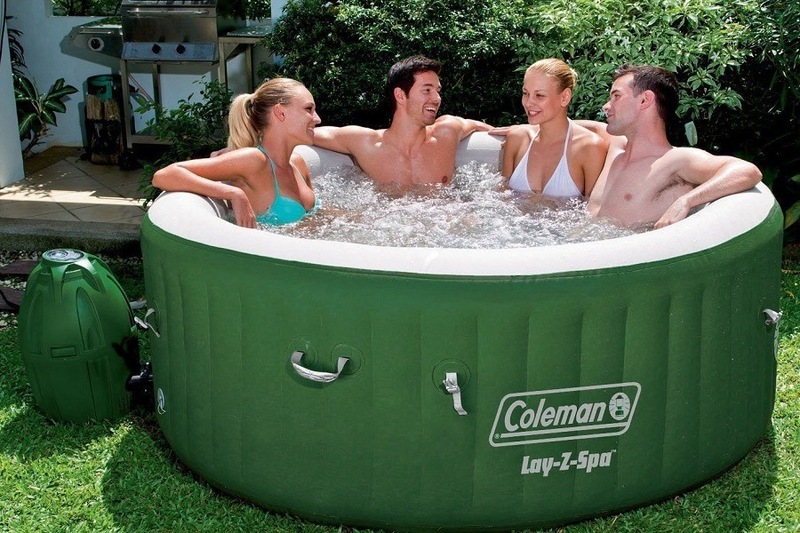 But inflatable hot tubs like the Lay-Z-Spa from Coleman are a lot less and what’s more, they can be put up when you want to use them and then taken down when you need to store them. 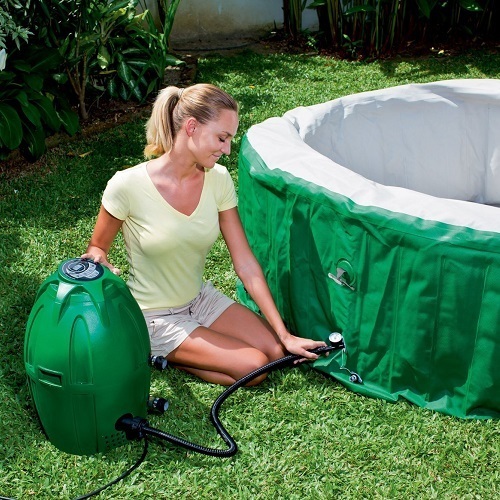 This portable and inflatable hot tub can be pulled out whenever you need to use it and then inflated instantly using the pump that is built right in. You don’t have to keep it up all summer, or find a permanent home for it in your yard. In fact, you probably shouldn’t because the more you keep it out, the more chances for it to become damaged. But when you are ready for it, you just pull it out and inflate it. Then fill it with water and you are ready to soak. This hot tub was made to meet the needs of consumers who have a small budget and nowhere to permanently park a hot tub. I have had really great results with this hot tub. I was already a big fan of Coleman products – because half of my camping supplies are made by them and they are usually the ones I seldom replace – so I was halfway sold before I even saw the other features. What took me all the way to the finish was how durable it was and how big it was. I have had no problems with this hot tub buckling under my weight or even when lots of other people are in the tub with me and so far it hasn’t popped, which is more than I can saw for other inflatable items at my house. Of course, other people have had really good results as well, so it’s not just me. 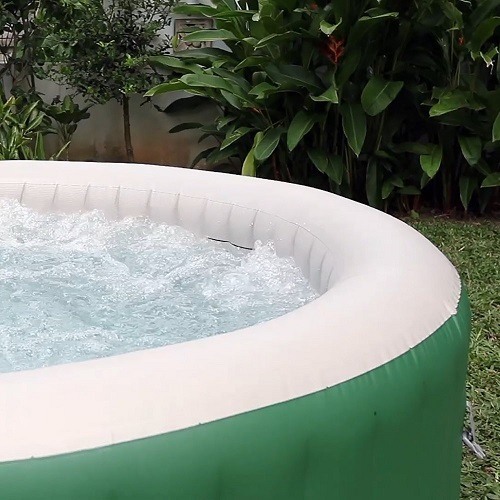 For example, there are hundreds of five-star reviews on Amazon for this product and people are impressed with how sturdy it is and how much like a real hot tub it is. Many people said that it not only met their expectations (which were fairly high to begin with) but it also beat them. There was also one person who mentioned that this was the best spa that they ever purchased, and even detailed the other spas that they bought before this one. This was the third one that they had bought in ten years and they fully expect this to be their last. 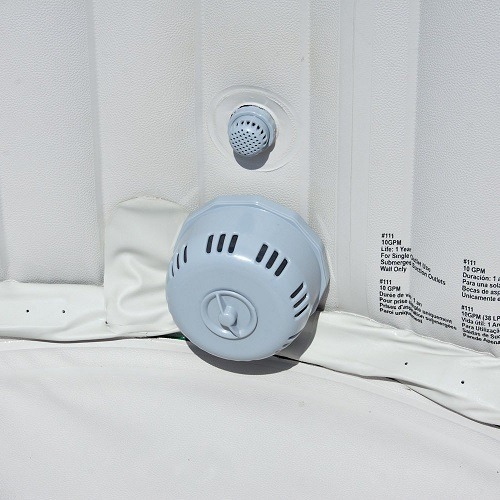 One thing that you want to be aware of here is that even though this is an inflatable spa that you can set up and tear down at your leisure, you still need to worry about the chemicals and pH of the hot tub. There are lots of guides on how to maintain your water and you’ll probably need to get some test strips, shock and other chemicals to treat the water before you soak. The buying advice in this case really has nothing to do with the product itself, but rather in how you use the product. These numbers came straight from one of the Amazon reviews, but as a user of this hot tub for more than a year now, I would have to agree. It has to do with your power consumption. If you keep your spa ready for soaking anytime then you are going to be spending a great deal of money on electricity. The customer who did the numbers estimates that you will pay an extra $100 on your electricity bill to keep your spa heated and ready to jump in at any time. But if you can wait two hours when you have the urge to soak, you cut that down from $100 a month to $2 an instance. So, if you use it 10 times a month, you pay just $20 rather than $100. This is very good advice and something that many spa owners might not have considered before the electricity has already been used. As far as my recommendation goes, it is an easy one to make. This is a terrific product that I really love. I have had wonderful success with it and everything that I have read from others makes me comfortable recommending it to you. 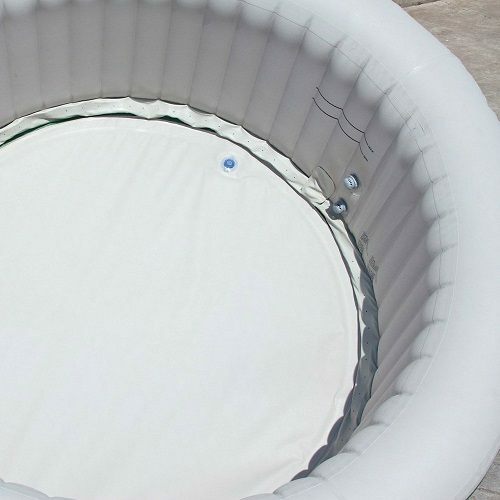 If you want to get the Coleman Lay-Z-Spa inflatable hot tub for your own deck or backyard, you can simply click on the link here and you’ll be filling, inflating and soaking with a cold drink on a floating tray in no time.